Shuffle for Card Magic Tricks - Introduction. Whether you're performing card magic or just playing a card game, you'll want to know how to shuffle a deck of cards. Here's a basic shuffle with a bridge that will serve you well. After you learn this shuffle, you'll have a foundation for your card sleight of hand. You can watch a video of the shuffle in action here. Hold the deck in your right hand on the short edges with the fingers on the bottom and the thumb on the top. Note the position of the right first finger that is pressing into the middle of the back of the deck. Note that these instructions start with the deck in the right hand. If you prefer to shuffle from the other direction, starting with the left hand, simply reverse the instructions. Shuffle for Card Magic Tricks - Run the Cards. While pressing with the right first finger, which bows the deck, run the cards off of your thumb and into the left hand. Note how the left hand is positioned to receive the cards on the fingers. When you have run approximately half of the cards, stop this action. Shuffle for Card Magic Tricks - Left Hand Takes the Cards. Now you have to reposition in the deck in the left hand. The left hand grabs half of the deck and holds its half in the same manner as the right hand by grabbing the rightmost side of the deck with the thumb. Note how the fingers of the right hand assist with this by levering the half of the deck up into the left hand. The right hand maintains its grip on its half of the deck. Shuffle for Card Magic Tricks - Bow the Cards. Begin to bow both halves of the deck by squeezing them between your thumb and fingers. Notice that the bend of the bow is towards the table. Again, note the position of the right and left first fingers that are pressing into the middle of the back of each half deck, which causes them to bow. Shuffle for Card Magic Tricks - Shuffle the Cards. Release the cards from your thumbs allowing the cards to fall and interlace. Try not to release the cards in blocks but one by one - allowing the cards from both hands to fall in-between each other. This will take practice. Also, with practice, you'll get faster and more efficient at this process. Shuffle for Card Magic Tricks - The Cards Are Shuffled. After shuffling, your hands and cards will be in this position. The cards from the halves in each hand are interlaced approximately half way the length of the cards. Shuffle for Card Magic Tricks - The Bridge. Grab the cards with your fingers along the short edges of the cards and your thumbs on top, and arch the interlaced cards. Most of the work when arching the cards is performed by the fingers. Once the interlaced cards are arched, you can release the fingers so the cards come together and fall into a single heap. This is known as bridging the cards. Shuffle for Card Magic Tricks - Let the Cards Fall. Let the cards fall. You're trying to allow the cards to fall on top of each other, maintaining the interlace of the cards. Shuffle for Card Magic Tricks - Finish the Shuffle. Straighten out the cards. Your shuffle is complete. 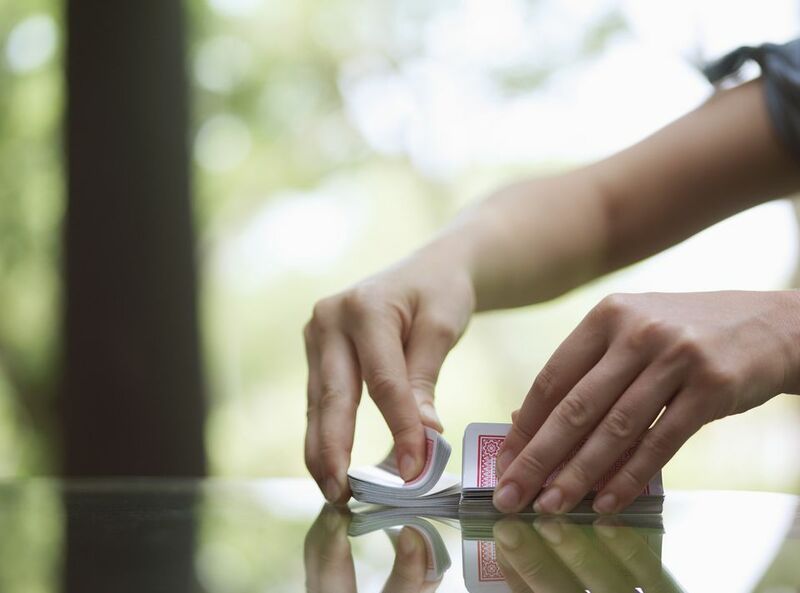 Now that you've learned a basic shuffle, you can learn more sleight of hand moves that will support your card magic in our collection of sleights with step-by-step instructions.